- Publisher All the writings and published sermons of Arthur Pink were closely reasoned from the Bible and addressed Christian life issues or doctrines that Pink believed needed special attention. Practical Christianity is a wide-ranging study of life after conversion. All the writings and published sermons of Arthur Pink were closely reasoned from the Bible and addressed Christian life issues or doctrines that Pink believed needed special attention. 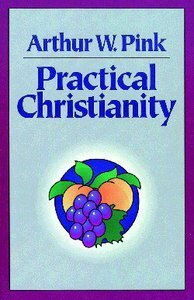 Practical Christianity is a wide-ranging study of life after conversion.